Personalise your possessions with these elegant letters and number monogram stickers made from high-quality brushed aluminium. 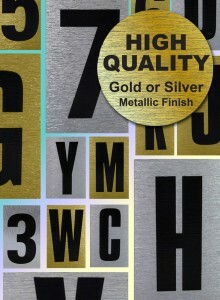 Classic Sign Monograms Stickers are designed to make your message sparkle. Whatever you need to say, with these individual letters and digits you will never be lost for words. Use them to label your mobile phone, satnav, brief case, Filofax, luggage, jewellery box, laptop, laptop bag, ipad, wallet and just about any other favourite possession that you feel deserves the glittering touch. Monograms are self adhesive, making them easy to apply on any clean, dry surface with a smooth finish. They are printed with high-quality inks, making them not just eye-catching but amazingly durable too. Classic Sign prints all our signs and stickers in the UK according to rigorous quality standards so you can rest assured that your monograms will be fit for their purpose and safe for use in any home or commercial environment. Monograms look great alongside larger format Classic Sign digits, also available in silver and gold finish, and can be complemented by our full range of decorative and information stickers to suit your needs. Simply choose from the letter and number monogram sticker options above and don’t forget to view our other ranges to complete your signage selection.